Will Philip Morris International Raise Its Dividend in 2019? Many dividend investors turn to tobacco stocks for high yields and growing payouts, and Philip Morris International (NYSE: PM) has been a great example of how this strategy can work well over the long run. Despite having a global business, Philip Morris is based in the U.S., and that's given it some distinct benefits from tax reform. As regulatory efforts accelerate overseas, though, Philip Morris International has faced the same challenges that its domestic counterparts have dealt with for decades. Even dividend investors have felt the pinch lately, with more sluggish dividend growth in recent years than they enjoyed early in Philip Morris' existence as an independent publicly traded company. Below, we'll look more closely at how Philip Morris is faring and whether shareholders are right to be worried about the dividend. 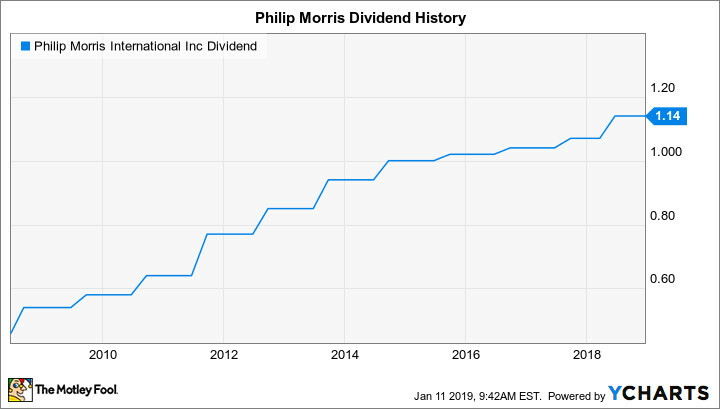 Philip Morris International started out strong in the dividend department, paying a healthy yield and making substantial boosts to the payout in its first several years as a publicly traded company. It was common for the tobacco giant to boost its quarterly payout by roughly 10% to 20% annually in those early years. 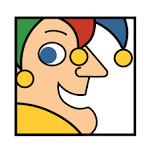 That continued in the tradition of its former parent company, back when international and U.S. operations were held within the same corporate entity. But as you can see below, Philip Morris ran into challenges in the mid-2010s that caused it to slow the pace of its dividend increases. 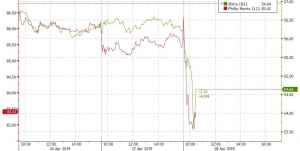 The strong U.S. dollar had a huge negative impact on Philip Morris earnings, and that in turn put pressure on the company by pushing payout ratios to worrisome levels. Gradually, those double-digit percentage hikes to the dividend turned into single-digit percentage moves, reaching a low point of 2% growth in 2015 and 2016. Over the past couple of years, investors have seen some improvement. 2017's increase accelerated to 3%, and last year's raise to $1.14 per share quarterly represented a nearly 7% boost. Fundamentally, Philip Morris is dealing with something it hasn't had to face before: weakness in its IQOS heated tobacco platform. Throughout the early stages of the platform's introduction, IQOS produced huge sales growth, especially in the key test market of Japan. The subsequent nationwide rollout produced impressive gains in revenue, helping Philip Morris offset declines in traditional cigarette volume. In early 2018, however, sales of IQOS in Japan unexpectedly slowed. 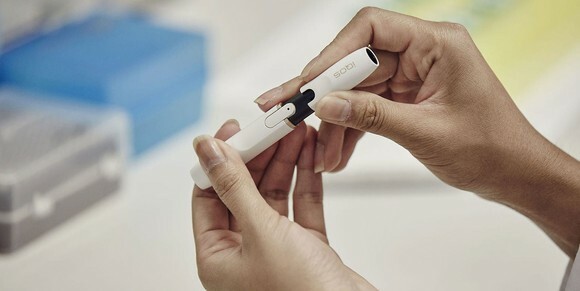 New competition had emerged in the island nation, but Philip Morris also pointed to its failure to make consumers aware of newly expanded production capacity of the HeatSticks tobacco inserts that IQOS uses. Inventory management issues were partially responsible for the disturbing numbers related to IQOS, but even so, just the idea that the heated-tobacco system might not have nearly as long a period of fast growth as initially expected called into question Philip Morris' entire strategy to replace traditional cigarettes with alternatives. Moreover, currency pressures have returned. In its most recent quarter, a strong dollar cost Philip Morris about $0.09 per share on the bottom line. That's only about 6% of its earnings for the quarter, but it's contributed to the current state of affairs in which the company's paying out more in dividends than it's earned over the past 12 months. That's not a problem temporarily, but it is something that could because difficult if it persists. Will Philip Morris boost its dividend in 2019? Despite its concerns, Philip Morris International still has ample cash flow available to continue to offer rising dividends. That has made it possible in the past for the company to keep boosting its payout, and having demonstrated its commitment to shareholders, Philip Morris isn't likely to clamp down on dividend increases entirely. However, it's quite possible that the tobacco giant will return to its strategy of limiting increases to a token $0.02 to $0.03 per share. Unless the company sees a breakthrough -- such as a Food and Drug Administration approval of IQOS sales in the U.S. -- 2019 could be a subpar year for shareholders on the dividend front. David and Tom just revealed what they believe are the 10 best stocks for investors to buy right now... and Philip Morris International wasn't one of them! That's right -- they think these 10 stocks are even better buys.